I opened my Etsy shop, Resparkable Vintage, a couple of days ago. I worried I wasn't ready. I only had 10 items listed to sell. (The listing is a s-l-o-w process for me!) But I had a deadline, dammit! And I really wanted to stick to it. Hey, maybe my shop isn't perfect. In fact, I can guarantee it isn't. But it's a work in progress. And I did it! I opened my Etsy shop selling my repurposed vintage jewelry. By my deadline. Even hours before midnight on the day of my deadline! WOOHOO. My mom would be so proud of me! Hopefully, people will see the 10 things I do have for sale at Resparkable Vintage and like them. And even more hopefully, buy them. I'll be listing a minimum of 2 new items every week. I'll hopefully get faster on the listings and be able to up that number to at least 5 things a week soon. Maybe I'll just go nuts and list 20 items each week, eventually! I'm so excited for people to see the necklaces, bracelets and earrings I make. Like I've said before, I almost called my shop "I'm So Not Selling This" because it's a phrase that's spoken often around this house. Honestly, I love all the pieces so much I can hardly bare to part with them. But the more I sell, the more I get to make! 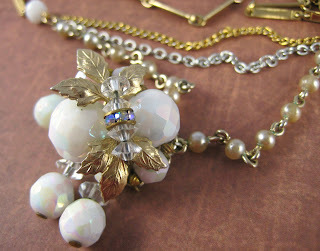 To see more pics and find out the details about this necklace and others, please visit Resparkable Vintage!